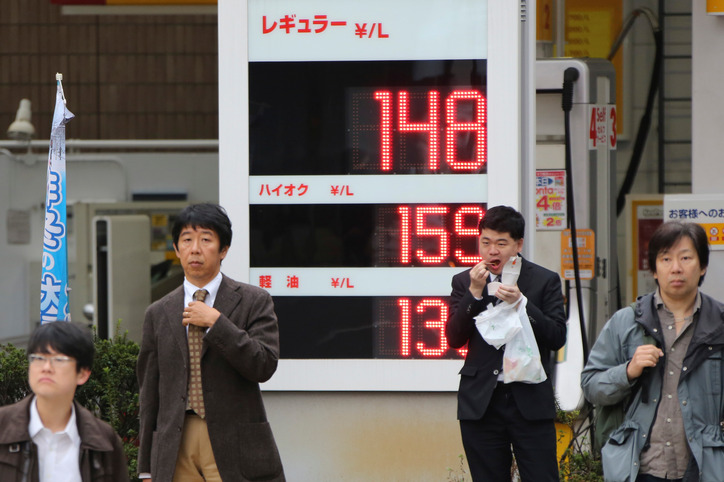 AP/Koji SasaharaPeople wait to cross a street in front of a Shell filling station with the electric indicator showing a liter of regular gas price, top, at 148 yen, or $US1.25, per liter (554 yen, or $US4.69 per gallon) in Tokyo Friday, Nov. 28, 2014. A renewed plunge in oil prices is a worrying sign of weakness in the global economy that could shake governments dependent on oil revenues. It is also a panacea as pump prices fall, giving individuals more disposable income and lowering costs for many businesses. Partly because of the shale oil boom in the U.S., the world is awash in oil but demand from major economies is weak so prices are falling. The latest slide was triggered by OPEC’s decision Thursday to leave its production target at 30 million barrels a day. Member nations of the cartel are worried they will lose market share if they lower production. Brent crude, a benchmark for international oils, was at $US72.50 a barrel on Friday, down nearly 30 per cent in the past three months and at its lowest in four years. U.S. crude oil slid 7.5 per cent to near $US68 a barrel on Friday and is down 27 per cent over three months. OPEC countries and other major oil exporters will feel the biggest negative impact. In Asia, lower oil prices are unambiguously positive for trade balances and government finances as the region is a major oil importer and some nations subsidise the price of fuels. But there are also some possible negatives. At the Esso filling station in Shimbashi, near the glittering Ginza shopping strip in Tokyo, prices remain relatively high. Japan is reliant on foreign oil, but due to import contracts there is a lag in cheaper crude filtering down to consumers. Also, a recent drop in the yen’s value will reduce the savings Japan can reap from lower oil prices. In June, regular gasoline cost $US1.40 a liter ($US5.29 a gallon) at Shimbashi. The price rose to $US1.46 a liter ($US5.53 a gallon) in July and was $US1.44 a liter ($US5.44 a gallon) on Friday morning. Prices are expected to fall but this welcome relief for households and businesses will complicate the government’s efforts to end Japan’s deflation. Beijing has cut prices repeatedly this year in line with declining crude prices. The Cabinet adjusts retail prices when crude changes by at least $US1.15 a barrel over a 10-day period. On Friday in Beijing, highest grade gasoline cost $US1.20 a liter ($US4.54 a gallon). In June, the price in the Chinese capital was $US1.35 a liter ($US5.11 a gallon). Cheaper fuel would ease financial pressure on manufacturers and small businesses at a time when economic growth has declined steadily over the past two years due to weak demand for exports and government efforts to cool a construction boom. Fuel prices have risen because the government has cut its expensive subsidies, more than offsetting the decline in global oil prices. Gasoline is currently 70 cents a liter ($US2.64 a gallon), up from 53 cents a liter ($US2 a gallon) in June. The higher prices triggered street protests, with some questioning why fuel prices were rising in Indonesia at a time when they were dropping elsewhere. The latest fall in crude prices may help ease tensions once it flows through to pump prices. New president Joko “Jokowi” Widodo says the money saved on subsidies will be spent on infrastructure, education and social welfare programs. Earlier this month, Malaysia took advantage of lower oil prices to end fuel subsidies. Starting Dec. 1, prices will be set at the end of each month based on a monthly average price. Currently, gasoline is fixed at 68 cents a liter ($US2.57 a gallon) and diesel at 65 cents a liter ($US2.46 a gallon). While saving on subsidies that were nearly $US7 billion last year, economists said the sharp fall in oil prices is negative for Malaysia, an oil-exporting nation. Opposition lawmakers have vowed to hold street protests if the government doesn’t reduce the price of gasoline to 58 cents a liter ($US2.19 a gallon) next month. Fuel prices have been steadily declining with the latest cut on Tuesday, but Energy Undersecretary Zenaida Monsada said if the price of oil continues to fall, it could mean job cuts for Filipino workers overseas. The Philippines is among the world’s top labour exporters, with about a tenth of its 100 million people working abroad, many in oil-producing Middle East countries. They send home billions of dollars that support their families and the country’s economy.